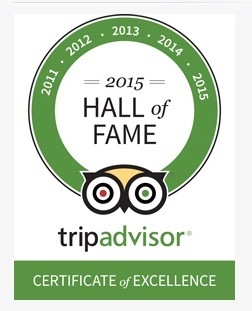 Please email us at Stay@NortheyStreetHouse.com or call 978-397-1582 for up to date quotes. To avoid disappointment, advance reservations are recommended. A one night deposit is required to secure the reservation. For a one night stay, the full amount is due as a deposit. If you’ll be arriving within 7 days of your reservation, the full payment will be charged. Full payment is due/charged upon arrival (October reservations are due by Sept. 1st). Payment can be made with Visa, MasterCard, or Discover. Check deposits can only be used if the reservation is made more than one month in advance and payment must be received within one week after the reservation is made or the reservation will be cancelled. 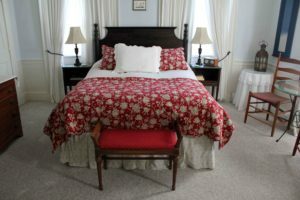 Our Salem, MA B&B’s small size means cancellations affect us significantly. For any cancellation or change of dates, we must receive 14 days* (30 days for major holidays) notice prior to your confirmed arrival for a refund of your deposit, less a $25 fee per room. Cancellations with less than 14 days (30 days for major holidays) notice, early check outs and no-shows, will be charged the full amount unless the room(s) can be re-booked for the reserved dates. If we are able to re-book the room(s), there is a $75 fee. If not, you are always welcome to send a friend or family member in your place. *Not applicable to groups of more than 1 room. 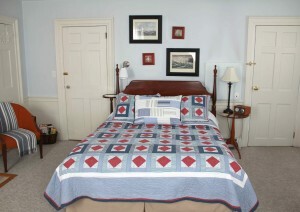 All rooms have a Queen-sized bed and can accommodate up to two persons. All rooms have a convertible twin bed. One additional person may be accommodated for a rate increase of $25-50 per person/per night depending on dates. Children and infants do qualify as guests as they require space and housekeeping. We welcome well-behaved children of all ages. 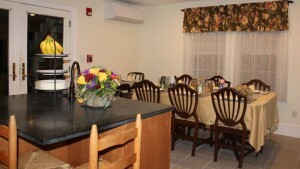 Our Apt Suite vacation rental can comfortably accommodate up to 4 people. Please note our additional per person rate increase described above. At this time, we are not able to provide any cribs or pack ‘n plays. Check-in is 3:00PM or later. Check-out time is 11:00AM. We ask that you email us your approximate time of arrival within a one hour time window.We want you to be able to maximize your time enjoying Salem. You can quasi-check-in (park car, pick up keys & visitor’s guide) even if your room is not ready yet, but not before our check-out time of 11:00AM. To ensure a smooth check-in, please text/call me at 978-397-1582 when you are about an hour from Salem. So that all guests can enjoy the peace and quiet of the inn, check-ins are not permitted past 9:00PM without prior arrangement. If you run into any problems, please just give me a call. Complimentary parking for one vehicle per room conveniently located on site. 100% no smoking indoors. Smoking is permitted outside with consideration for other guests that might be in the Common outdoor areas. While accidents do happen, guests will be financially responsible for damage due to gross negligence.